"Many argue that the modern family is an anachronistic institution whose demise is only a question of time. Looking to the family's future, the eminent sociologist Brigitte Berger argues that despite being weakened and embattled, the family will survive as a fundamental social institution. The family has been the cradle of the modern social order for some three hundred years, and will remain the basis for any society concerned with happiness, liberty, equality, and prosperity for all its members. Rather than being condemned to the dust heap of history, or becoming a simple lifestyle choice, the modern family has a number of enduring strengths that will ensure its survival. 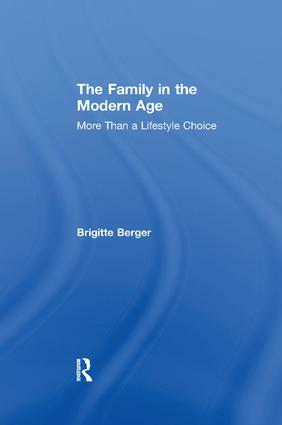 In The Family in the Modern Age, Berger focuses on four major areas of concern. First, she demonstrates that the short shrift given to the institutional dimension of the family misrepresents the importance and the role of the family today. Second, she documents the close cognitive fit between core elements of the modern family and the stability of modern society, and argues that any society that ignores this connection does so at its own peril. Third, Berger investigates the degree to which currently identified problems may endanger the modern family's vital individual and social functions. And finally, she develops reasonable projections of the future of the family that will be core elements contributing to the creation of a politically democratic and economically prosperous world. Berger takes a long-range view of ""the career"" of the conventional family in the twentieth century. Her perspective is distinctly different from that widespread in scholarly literature today. She takes account of recent demographic shifts in behavior relating to sexuality, marriage, family structure and values, relationships, and family functions. Berger considers hotly contested contemporary issues relating to the family-gay marriage, divorce, abortion, women and work, issues of child-care, among others. Bu"